Ok, you already have a good dose of canyoning experience and you decide to make your hobby your job! Very cool but what now? There are several courses which are not recognized in each country. Do you want to correct in the German-speaking corner of Europe to work or just the Mediterranean way? 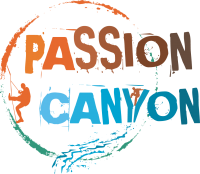 The Passion Canyon Guide Training teaches you cast the best techniques of different programs in one program. When I was in 2007 with my professional guide training began I have to CIC chosen because they offered a course in English. But when I wanted to work in France go by that I did not get a work permit in the first instance (professional card) and I had to pass the French exam at the CREPS. That was nice’ because they accepted a lot of techniques of CIC not and I had to retrain me to the French system (and French are very good with rope techniques!). Finally, long story short version, you want to prepare a training guide I can help you do it well! I use more French rope access, But I've also learned a lot from the CIC. If you are interested send me an mail and we create a customized program. Guides training I give only out of season so we can take advantage of challenging conditions as much water in the spring or even in autumn when the more challenging canyons condition as lesson Oules de Freissinieres, chichin for example.